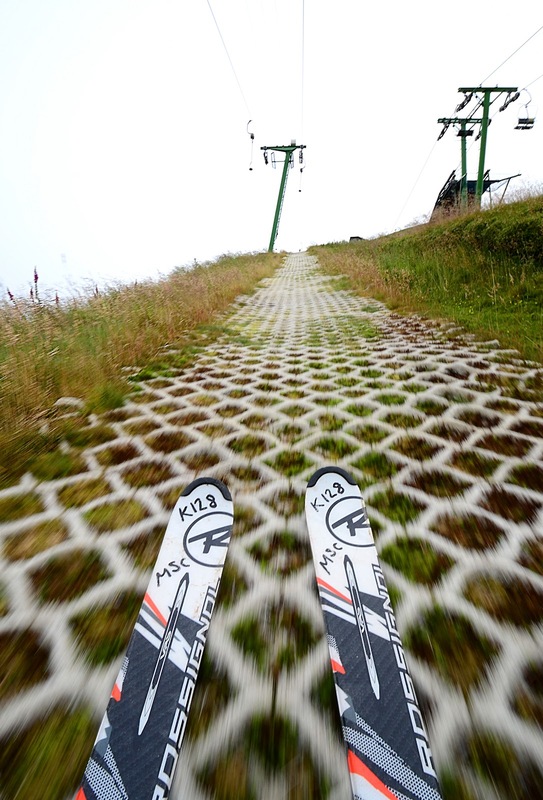 This ski area is so hot that it melts your skis. Water would help, and also make the skiing faster. But their sprinkler system is being replaced, and this also happens to be the only day on our vacation when it does not rain. 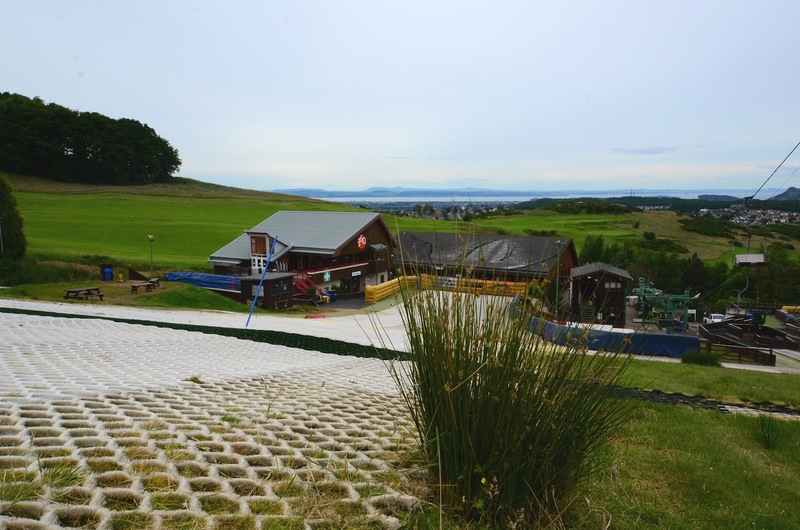 We are at the Midlothian Snowsports Center in Edinburgh, in the middle of the summer. My second day of skiing in the UK. "Sir, do you have pants"? Even if it is warm, they require you to use long pants, jackets, and gloves, as a fall on the plastic may easily hurt bare skin. 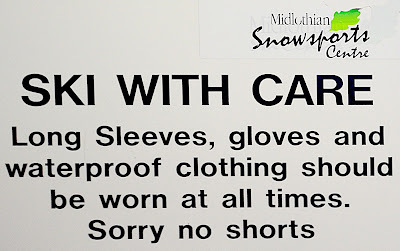 So on my first attempt to enter the ski lift on my shorts was cut short by the liftie shouting that I can't go to the slope "without pants". Luckily had long pants with me, so after a small delay I was able to get to the slope. Sir, do you have pants? 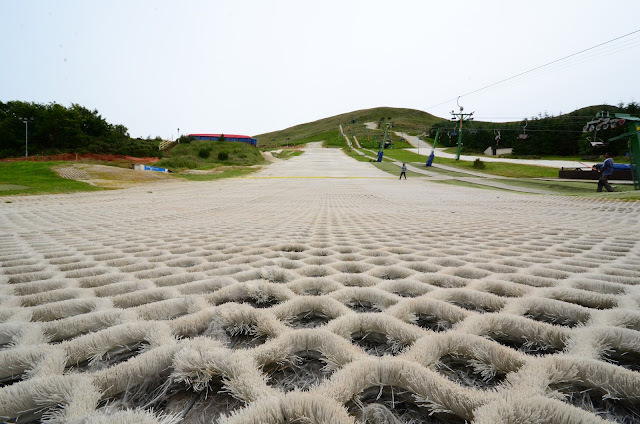 The slopes are covered with plastic matting, allowing the ski area to be used at any time. (There is typically no snow here even during the winter.) Holes in the matting allow grass to grow in the slopes, and at times you can not be quite sure whether you are skiing on grass or plastic. There is one long main slope, a shorter training slope, a very small kids slope, and the fun park with jumps and rails. There are two button lifts and one chair lift, though the chair lift only runs at certain times. Skiing and golf on the same day, same place? 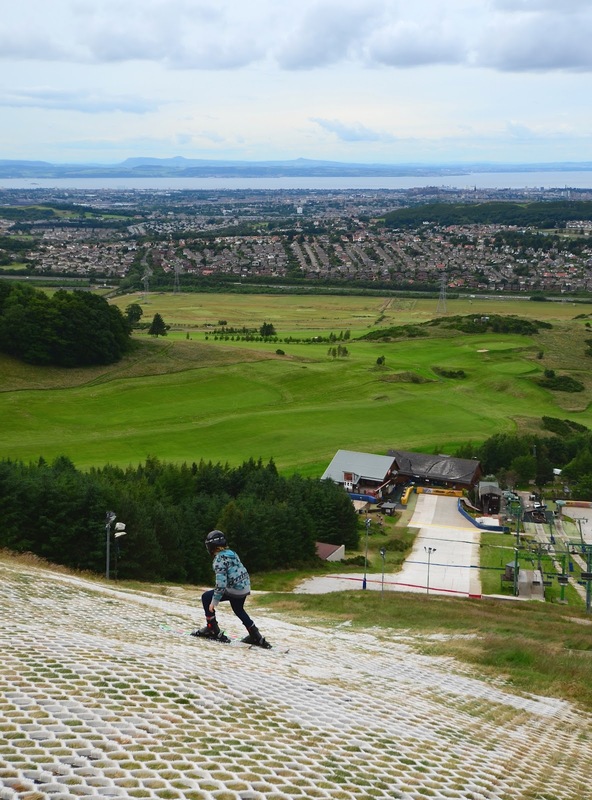 Amazingly, the Scottish olympic team practices here, including a former top downhill racer. There was a short race track in the slope even when we visited it. The feeling in the slopes is quite different from regular snow. 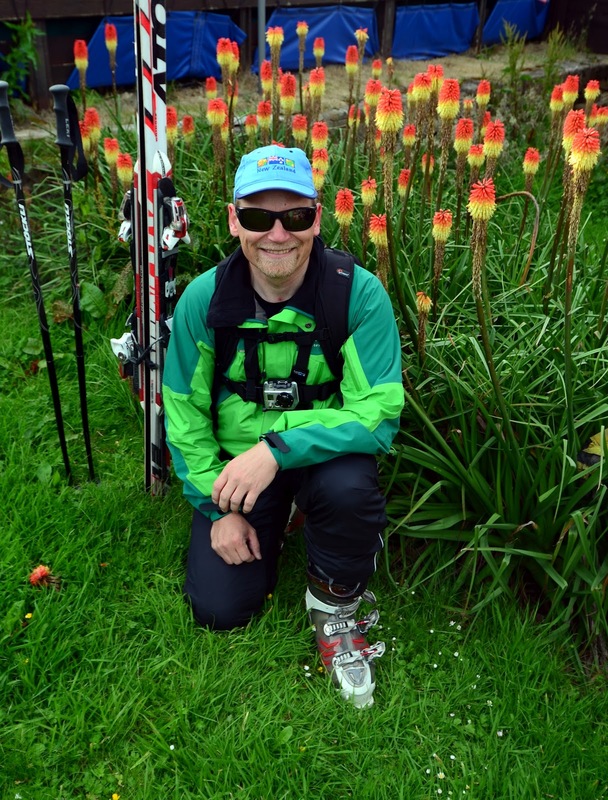 Mind you, we were there on a day when the sprinkler system was not operating, and the feeling is likely different on a wet slope. Interestingly, the slope felt otherwise quite similar, but braking and canting had far less effect than it does on snow. This is reason for choosing "plastic ice" as the name of this blog article. 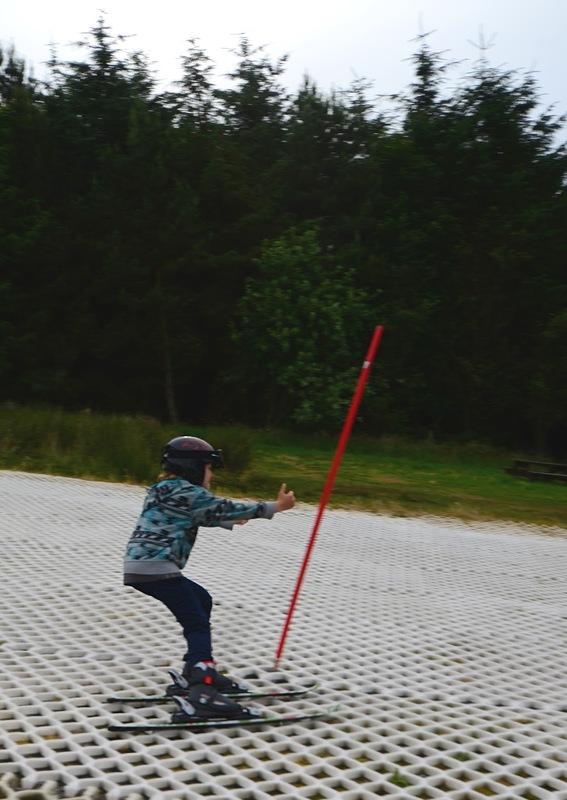 In fact, most icy ski slopes would be easier to break in than the plastic. And I can not imagine that the sprinkler system would make braking any easier. Well... apparently the after-ski is not that great. 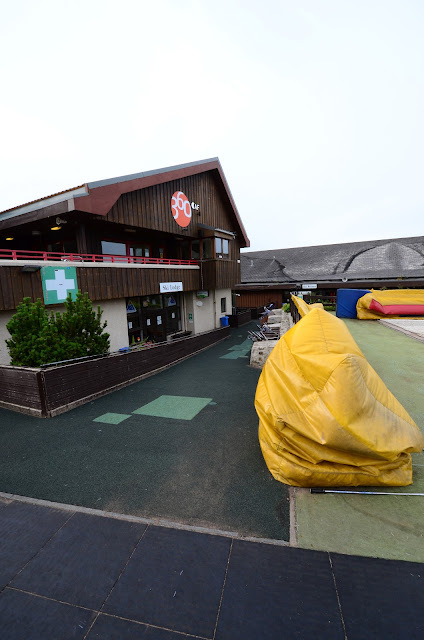 Cafe 360, the only food and drink source in the area closes one hour before the ski slope closes. By the time we had taken off our gear, the entire facility was empty, including all staff. 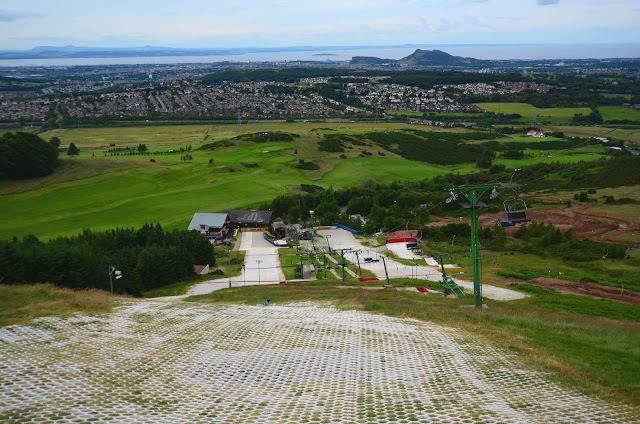 The slope resides 10 kilometers from the city center of Edinburgh, near Hillend. It is open every day from 9:30 to 19:00 (18:00 on Sundays). One hour lift ticket costs 12 £. 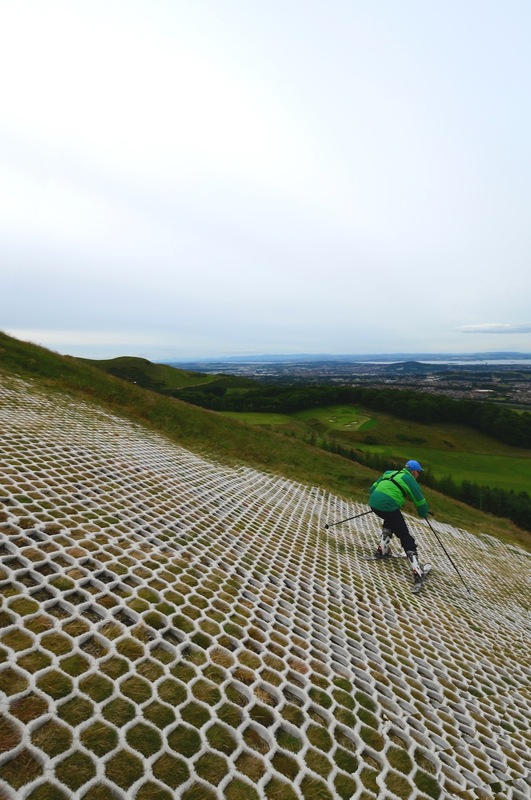 The longest slope is 400 meters long. We took a cab to the slope at the cost of 20 £. 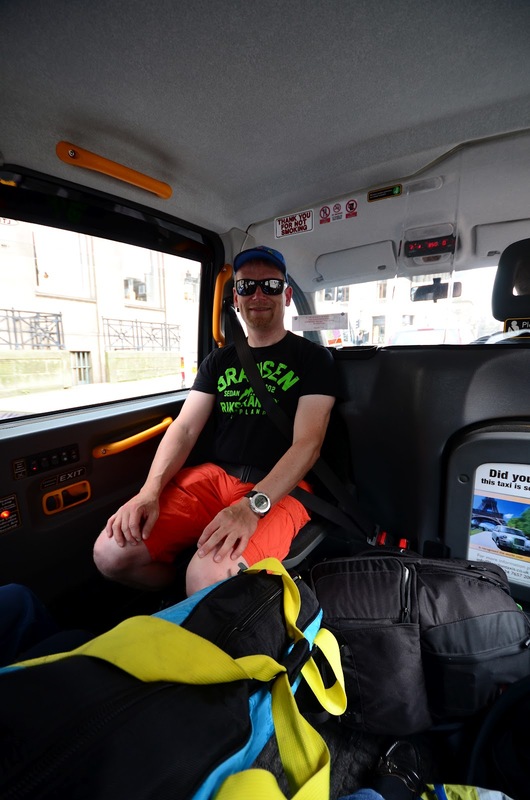 Make sure you have a phone number to call for a taxi if you plan on returning this way as well, and prepare for some waiting before the taxi arrives in a busy Edinburgh evening. 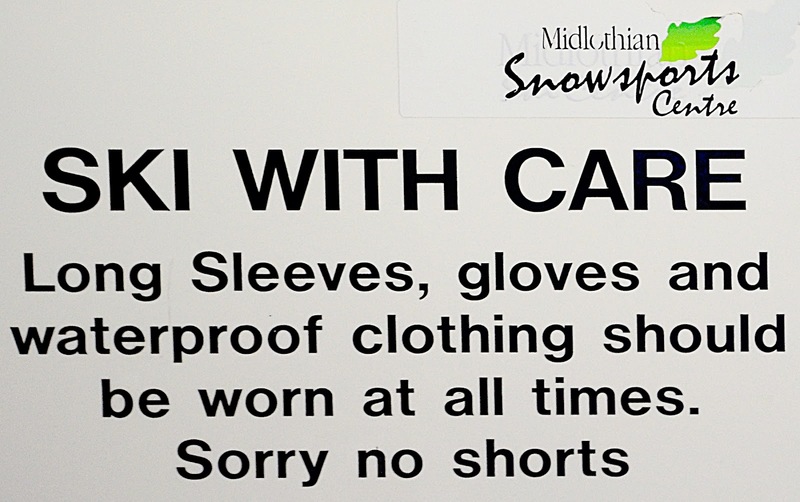 Use protective clothing all over your skin, and light gloves. I suspect that the hole-filled plastic may hurt you even if well clothed. Luckily we did not fall. This was my first outdoors artificial ski slope experience. It was interesting, and different from all other ski experiences. There is a definite 1960's feeling to this base (and indeed the center was opened then). I find it difficult to think of the place as something where I'd go to on a regular basis, however. Or maybe I would, if I lived in Edinburgh. In any case, the center is a friendly facility, and I always like the community ski hills. This is a must-visit place for Edinburgh tourists. Recommended!